The Midwest is undergoing its biggest energy transformation in half a century. Long dependent on coal for the majority of its electricity, the region now sits at an important crossroads—one that will determine where its electricity comes from for decades ahead. An increasing number of coal plants in the region can’t compete economically with wind power or natural gas. Many have already closed, while others have been announced for closure in the coming years. This trend presents a unique opportunity to move the region toward a cleaner energy future that will transform an unsustainable, polluting energy system into one that creates opportunities for economic prosperity and job growth powered by sustainable, clean, low-carbon and homegrown energy sources. The Midwest is home to some of the best renewable energy resources in the world, especially wind. The region is also endowed with a strong industrial base and leading research universities, where a tradition of hard work and innovation has long made the Midwest an economic engine for the entire nation. Few areas of the world have this ideal mix of resources, industrial capacity, and knowledge base that can successfully drive a clean energy future. With these unique advantages, the Midwest is poised to significantly ramp up its renewable energy supply in the years ahead. The benefits of renewable energy are clear, yet it faces formidable opposition from the fossil fuel industry and other special interest groups that have a vested interest in slowing progress toward a clean energy future. Their campaigns of misinformation seek to confuse the public about the facts of renewable energy and delay action on practical, achievable energy solutions. To fight back, UCS works to support a clean energy transition throughout the Midwest region, including efforts to increase state renewable energy standards that require utilities to obtain a designated portion of their electricity from renewable sources, and energy efficiency resource standards that require utilities to invest in energy-saving technologies to help their customers use less energy. Michigan is well on its way to meeting its current 10 percent-by-2015 renewable energy standard, but without new policies in place to strengthen and extend the standard, renewable energy development will drop off significantly. Governor Rick Snyder initiated a public discussion in 2013 about Michigan’s energy future and announced strong clean energy goals for the state in a public address in December. UCS was heavily engaged in this discussion, providing scientific information on a number of energy-related topics to the governor and the state’s utility regulators, which helped the Michigan Public Service Commission conclude that Michigan could cost-effectively achieve at least 30 percent renewable energy with in-state resources while maintaining reliability. As the discussions about the state’s energy policy progress, UCS will continue to push for strong policies that will move Michigan towards a truly clean, reliable, and sustainable energy future. Ohio stands at a crossroads. Historically among the most coal-dependent states in the region, utilities in Ohio now plan to retire a significant portion of the state’s aging fleet of coal-fired power plants and must decide which energy resources will best serve Ohio ratepayers over the coming decades. Utilities are just now beginning to develop renewable energy and energy efficiency resources to meet the state’s modest clean energy standards. These standards have been under constant attack from fossil fuel interests and the state’s investor-owned utilities, who want to thwart Ohio’s use of clean energy resources. UCS has helped fend-off such attacks on renewable energy and energy efficiency standards in Ohio (and other states) by providing analysis that shows how a diverse electricity portfolio with significant contributions from clean energy resources offers substantial benefits for the Buckeye State. With one of the strongest renewable energy standards in the country, Minnesota is a national clean energy leader — and it's not turning back any time soon. In spring 2013, Minnesota passed a law creating a solar energy standard that requires utilities to generate 1.5 percent of their electricity from solar energy. UCS is now working to increase the state’s current 25 percent-by-2025 renewable energy standard to 40 percent renewables by 2030. While Minnesota is poised to build on its strong track-record of supporting investment in clean energy technologies, fossil-fueled power producers have stood in the way of more ambitious clean energy policies. 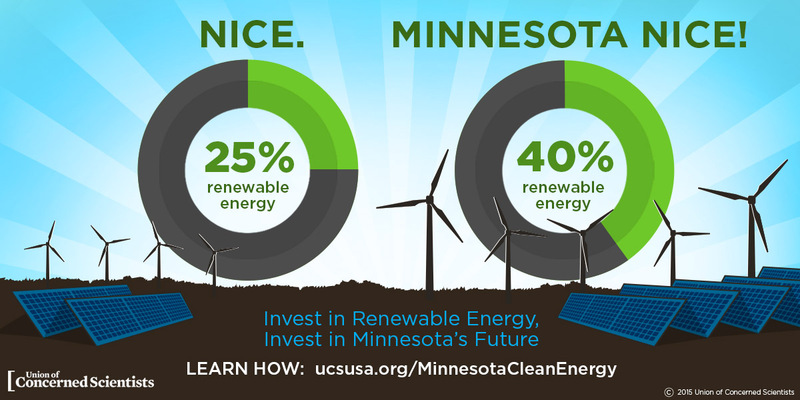 UCS is working to overcome this opposition and ensure that Minnesota continues to show other states the way forward to a clean energy future. Illinois has a current renewable energy standard that requires Illinois’ electric utility companies to supply 25 percent of the state’s electricity from renewable sources by 2025, a policy that has created jobs, kept energy dollars local, protected public health, and reduced global warming emissions. But today, an overly complicated funding system has stalled the program, and little new clean energy investment will occur in Illinois unless this problem is fixed. UCS is working to pass legislation that will allow Illinois’ clean energy standard to deliver on its potential to ramp up wind power across Illinois. The state of Iowa is one of the nation’s leaders in generating wind power, currently generating a quarter of its electricity from wind; only Texas and California generate more wind power. UCS works with state and federal officials in Iowa to continue the state's efforts as a national leader in renewable energy and energy efficiency. With a strong manufacturing base, large agriculture industry, and abundant renewable energy resources, Wisconsin is well positioned to reap the benefits of strong clean energy policies. As Wisconsin’s current standard of generating 10 percent of its electricity from renewables by 2015 begins to level off, the state must act soon to maintain the current level of investment and benefits it enjoys from an renewable energy standard. UCS collaborates with Wisconsin partners to ensure that the science and facts are well represented in this policy debate. Home to vast farmland, top academic institutions, and wind power facilities, Indiana is well positioned to transition from a fossil fuel-based economy to a clean energy economy. Investment in wind farms has begun in Indiana but the state has significant untapped renewable energy resources, which could be developed if Indiana adopted clean energy policies like those in neighboring states that have spurred significant investment in clean energy generation. UCS works with Indiana lawmakers, coalition partners, and key stakeholders to support a sustainable, clean energy future for the state. The fossil fuel industry continues to leverage its influence in the state legislature to maintain an overreliance on fossil fuels for electricity generation in Missouri. UCS continues to fight back attacks to the existing clean energy standards and brings science to the policy-making conversation throughout the state.